Electronic Pressure Monitor System for 12 and 24 volt systems is the third component which makes up the RESPA Cab Air Quality System. 5V variable output signal can be used for remote monitoring systems. Units can be set to inches of water column (default) or Pascal. Audio Alarm can be set to on or off; if engaged, volume can be adjusted. LED Alarm: The lighted indicator illuminates whenever the cab pressure drops below the preset minimum threshold for more than ten seconds. This feature cannot be disabled. The ten second delay allows for normal door opening and closing without setting off the alarm. Low Pressure Signal Alarm: This feature is internal in all units. It can be activated or deactivated during setup, and the volume level can also be adjusted to suit the enviroment. 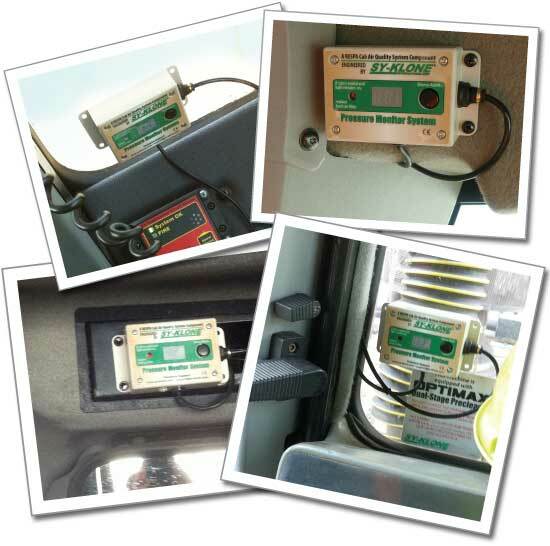 If the feature is activated, the alarm will sound whenever the cab pressure drops below the preset minimum pressure level for more than ten seconds. It automatically self-resets when the cab pressure returns to normal or when a off/on power cycle is completed. Numeric Display: This indicates the realtime pressure in the cab. During setup, you can select whether to display units in inches of water column or in Pascal. Power: The unit operates whenever the machine is switched on. There is no separate power switch to turn the Pressure Monitor on or off. Silence Alarm Button: Sometimes it is necessary to open a window or door for more than ten seconds. This will set off the alarm. The alarm signal can be silenced by pushing the button. (Note: the light will remain on until pressure is restored.) The alarm mode is self-resetting when the cab pressure normalizes or with an off/on power cycle. The alarm is again armed and will sound after a ten second pressure drop. Quick Connect Fitting: The included air line attaches here. Electrical Wiring: Connects to any convenient DC voltage connection between 9 VDC and 36 VDC, so the same unit can be installed on a 12 or 24 volt system. Low Voltage Pressure Signal Port: The unit includes a 0 to 5 volt output signal that can stream realtime pressure informtion to an on-board computer. The 1/8-inch mono plug signal port puts out a low power voltage signal that varies with the pressure reading. See Technical Specifications for details. This low voltage output signal chart can be used to calibrate real-time pressure data when sent to a computer or telemetric system. "Installing Sy-Klone's RESPA and Pressure Monitor was less than the cost of one MSHA fine, and we are back in compliance!" Read the full story including MSHA test data in our Mining News & Case Study section. Our High Standards Meet THEIR Standards too!